Dugan's Malaga pattern is quite hard to find. 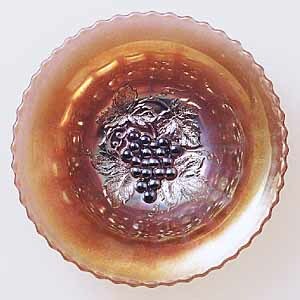 The pattern has a large group of grapes in the center resting on top of a bunch of leaves; the outer parts are plain. 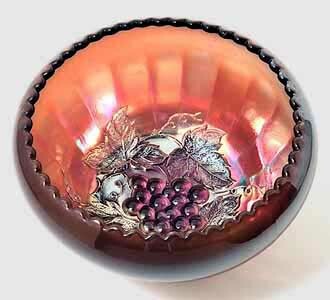 In case you were wondering, Malaga is a sweet Spanish wine and is pronounced (according to Webster's), MAL-a-ga. Only a handful of pieces in this pattern have sold in the last 10 years. 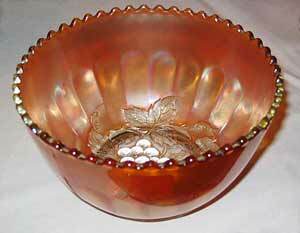 The rosebowl above (center) is amethyst and is from the collection of Carl and Eunice Booker. 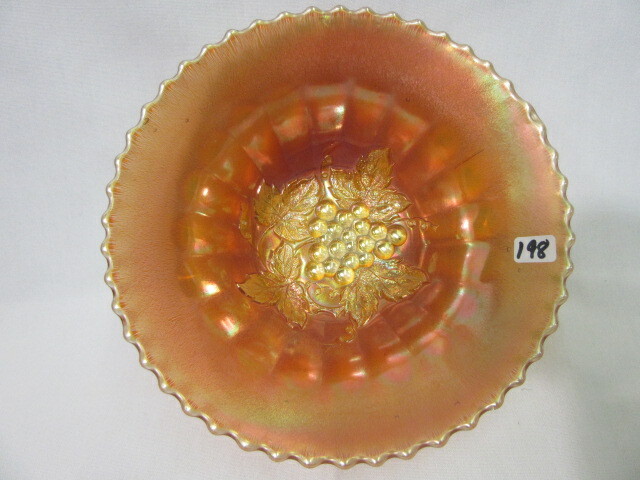 Above (right) is an unusual nut bowl shape in marigold sold at the 2009 Lincoln Land Carnival Glass Club auction for $25. Thanks to Carl Booker for the photo.